I picked up this Klaus Johann Grobe 7" along with the J.C. Satan record from yesterday to keep my Trouble In Mind 7" collection complete. While the J.C Satan wasn't really my thing, I get how others like it. 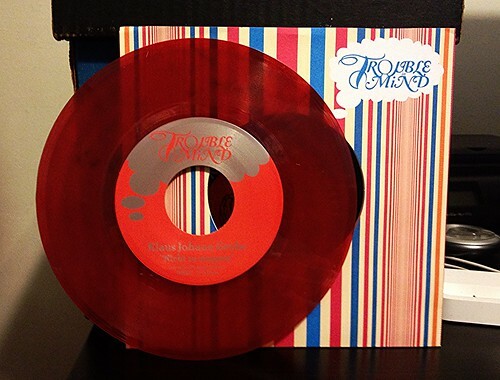 This Klaus Johann Grobe 7" on the other hand, this is totally over my head. The A-side "Traumhaft" is slow, pulsating and chock full of synth. The vocals are pretty deep in the mix and the song just chugs along, never really going anywhere other than the one direction it started off. B-Side "Nicht zu stoppen" is just as weird. Lots of organ and echoey vocals that seem to just repeat themselves throughout the song. On the plus side there is a moment that seems like a genuine chorus in this one. I don't know, I just don't get it.